After failure stared at the founders of bayt.com, a West Asian job portal, following the dotcom bust of 2000. Yet today, bayt.com is the leading job portal of the region. Its traffic, revenue, job postings and profitability are higher than all its competitors combined. This case study looks at how the portal managed this transformation. EXECUTIVE SUMMARY:Failure stared the founders of bayt.com, a West Asian job portal, in the face following the dotcom bust of 2000. They had neither a strong presence nor deep pockets. Yet today, bayt.com is the leading job portal of the region. Its traffic, revenue, job postings and profitability are higher than all its competitors combined. This case study looks at how the portal managed this transformation. The founders of job portal bayt.com had a vision - to be a globally recognised and admired institution. That vision was at stake when the dotcom bubble burst in 2000. At the time, Internet penetration in West Asia was less than one per cent and there were about a dozen Internet companies in the region that had been launched with financing in excess of $20 million each. Bayt.com did not have the kind of access to capital that its peer start-ups did and faced a dilemma on what it should do. Its founders knew they had to do something radical to succeed. They made two changes to their marketing strategy that proved to be the tipping point in their journey. The first was to launch the site with as much fanfare as they could afford. They went aggressive with a television advertising campaign, a novel idea as far as Internet companies in the region were concerned. TV advertising was both expensive and inefficient, but it gave both customers and jobseekers the impression that bayt.com was a lot bigger than it really was and enabled the company to open doors it couldn't previously. The company used this newly found respect to negotiate relationships whereby it became the job site for various partners. The partners were primarily portals interested in driving and maintaining traffic to sell online advertising. On the other hand, bayt.com was primarily interested in getting as many résumés as possible so it could monetise them from employers. The portal approached its partners with the argument that having a job section on their sites would drive more traffic to them and, therefore, more page impressions they could monetise through advertising. For bayt.com, it ensured that every time a jobseeker visited any of West Asia's leading sites he/she was exposed to the job portal. It encouraged people to build a résumé on it. The strategy worked wonderfully. At practically no cost, a significant amount of registrations came onto the portal. The initial hurdle of establishing credibility had been overcome and now bayt.com moved on to establishing itself as the leading job site in West Asia, winning several industry awards along the way. In just13 years, it has grown exponentially and is ranked as the number one job site in West Asia and North Africa. It has expanded to provide end-to-end employment solutions, career planning tools and is now available in three languages. Until bayt.com was created, employers and candidates used recruitment agencies and word of mouth references for soliciting and selection. But traditional recruitment agencies were not able to connect candidates with top employers without paying hefty fees and passing them on to the employer, thus creating a need for an online platform. Bayt.com initially served two strategic segments - cost-conscious employers and jobseekers. After the site gained traffic, it added another segment - the advertisers. Choice: The sheer size of the database gives employers a choice they never got before in the region. Rabea Ataya, CEO and co-founder of bayt.com, compared the company's model to a shopping mall where the shoppers are the jobseekers and the renters are the employers. The more shops there are, the more shoppers you get and vice versa. Today, bayt.com has over 12 million résumés and it gets some 5,000 résumés per day. Speed and ease: The technology is so efficient and convenient that human resources departments do not have to filter résumés anymore. Earlier, they had to go through reams of résumés to shortlist candidates. Employers can now search through candidates' profiles, gauge their knowledge on relevant topics, and evaluate specific skills and the fit for the position. The traditional method of hiring through a recruitment agency could take 90 days or even longer. This has been considerably reduced with bayt.com's customised search options for employers and jobseekers. Additionally, jobseekers can pay extra to feature their profiles for a specific organisation, thereby shortening the hiring process timeline for both segments. The speed and ease with which employers and jobseekers are able to navigate the site has led to seven million visitors per month on bayt.com. Cost efficiency: As organisations have become more cost-conscious, the online recruiting model has become even more attractive. For example, an ad for a single position in Gulf News, the most popular daily in the region, costs about $600 for a day while a job posting with just as much information on bayt.com costs $170 for 60 days. Clearly, bayt.com has eliminated the recruitment agencies and the associated hefty fees. In addition, an organisation can get year-round access to bayt.com's extensive database for approximately $5,000, a feature that traditional media cannot provide. revenue almost doubled for its fi rst eight years of operation from 2000 to 2008. It suffered one bad year when revenue fell 30 per cent in 2009. Post-2009, it has continued on a double-digit growth track. The company offers a strong value proposition to advertisers as well. It provides better résumé targeting than any other medium in the region. Any company advertising with bayt.com can monitor and adjust its ad campaign in almost real time. The portal also offers a more cost-effective solution when compared with traditional and other online media. Compared to traditional recruitment agencies, Gulf News, other online platforms such as monster.com, gulftalent.com and naukrigulf.com, and the word of mouth medium, bayt.com certainly ranks highest on cost efficiency, ease of use and local knowledge, which is reflected in its value network. The portal's centralised and sophisticated technology enables it to provide real-time information on statistics for both employers and jobseekers. 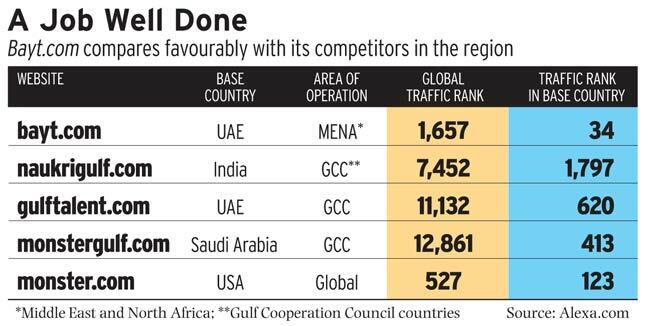 This is quite an achievement for a company that was born in West Asia, with competitors such as monstergulf.com (part of monster.com) which are international players. Call centres in Jordan and Dubai cater to most customers in the region, while sales offices in the United Arab Emirates, Kuwait, Qatar, Saudi Arabia, Bahrain, Lebanon, Egypt, Morocco, Pakistan and Sri Lanka provide the localisation that is critical to its success. Jobseekers and employers get local knowledge and news on specific sectors, companies, candidates, research reports on local and regional trends and customised reports for their profiles. In addition, bayt.com has built customised social media features into its platform that allow users to make their profile public and have followers. Bayt.com looks at its marketing in four steps: brand building, encouraging users to try out the site, driving purchases, and guaranteeing repeat customers. For brand building, it uses social media (more than 200,000 likes on Facebook and 35,000 followers on Twitter) as well as traditional media, with ads in newspapers such as the Gulf News. However, CEO Ataya says he is yet to see social media sites like Facebook drive traffic on bayt.com. For encouraging users to try out the portal, it uses search engine optimisation, search engine marketing, affiliate networks, and various partnerships in what it calls "white labelling". Driving purchases and guaranteeing repeat customers are seen as efforts carried out by its sales force. Most of its postings are sold through relationship managers in its 12 regional offices and its technology headquarters in Jordan. Jobseekers can access most services through the Internet and a few premium paid services through regional offices. Most general inquiries are handled through the call centres. The traditional recruitment agency model is not employed. Direct sales are done over the phone and the Internet, where each account manager has 30 to 60 accounts, on which they earn commission. In this model, employing staff on a salary plus commission basis when compared with the traditional model minimises fixed costs. Further, the sales staff is much more productive as they are handling 30 to 60 accounts at a time due to less personalised time with the customer but more on the phone and Internet. Also, many variable cost factors have been converted into revenue generators such as premium services for jobseekers and 'white label' services for employers. Most employers at some point need to decide whether they should build an in-house recruitment platform or partner with technology providers such as bayt.com and host a co-branded and integrated careers portal with a back-end platform hosted by the technology provider. Bayt.com calls this a 'white label' strategy. It offers its recruitment platform under the title "Careers Sites" and is used by many private and government organisations. This allows jobseekers to access the employer platform, which is in turn routed to bayt.com. Additionally, it helps employers to upscale their image as a modern company with a professional and user-friendly online career portal to attract and retain top talent. The benefits of this strategy include converting visitors into potential candidates at much lower costs and minimal time by filtering résumés and interacting with only relevant candidates. The additional benefit of the 'white label' strategy is in the saving of development costs, faster availability of the service and an expert partner who is responsible for updating the technology and features. Bayt.com competes with the likes of SAP and Oracle for the 'white label' software-as-a-solution provider. However, they don't see them as competitors in West Asia because bayt.com's platform has many more bells and whistles which make it far superior to its competitors. Bayt.com compares favourably with its direct competitors such as monstergulf.com, naukrigulf.com and gulftalent.com, which provide more or less the same kind of products and services targeting the same geographical segment. Bayt.com is more successful than any other in this category. It has a much more meaningful global traffic ranking than those companies. This ranking is not limited to recruitment portals and is across all websites on the Internet. It is also more successful in terms of job placements, popularity as a website, and standing in the market. Bayt.com has enjoyed robust revenue growth since its inception. Its revenue almost doubled for its first eight years of operation from 2000 to 2008. It then suffered one bad year when revenue dropped 30 per cent. Post-2009, it has continued on a double-digit growth trajectory till date. The company has a net profit margin of 25 per cent. Monster.com, the largest online recruitment company in the world, had an annual turnover of about $1 billion in 2012 and earned $212 million in the first quarter of 2013, with fairly low operating profit margin of four per cent, which is comparable with the results of the several preceding quarters. Against this backdrop, it is remarkable that bayt.com has fared so well and is maintaining such growth and hefty net income margins. On the cautious side though, it must be noted that the dynamics, economies of scale and bayt.com's specific focus on one region make the comparison limited at best. Monster.com's difficult situation denotes a difficult environment for big, diversified players in this field, hinting that bayt.com's expansion plans may be challenging, facing difficulties in moving to markets that it is not as familiar with as well as struggling with negative pressure on earnings in the wake of increasing costs and a burgeoning operation. This case study raises three interesting questions. First, why did bayt.com succeed? Second, why did it succeed in relation to its competitors, especially a globally successful one like monstor. com? And, what are the challenges for the company? The value proposition of bayt.com was simple and attractive. Essentially, it was to reduce the cost of and the time taken to match a potential employee with a firm looking for the set of skills that potential employees possess. Traditional approaches were costly, limited in scope and time consuming. While the idea is simple, pulling it off is not. Why? Firms want to go where there are large numbers of potential employees and jobseekers want to go where there are a large number of firms looking to hire. How did bayt.com solve this problem? By making the service free for potential employees and charging the firms for facilitating the matching process. The cost comparison with traditional media was appealing and unquestionable, as was access to jobseekers across the Gulf and the speed of the process. Bayt.com's TV advertising campaign was innovative for an Internet company. It gave the impression of an already successful company and so attracted traffic to its site. The company also had a clear business model and kept the focus on potential employers and employees before bringing in advertisers. Many Internet-based firms that relied on advertising revenue to drive business failed because advertisers would participate only if there was a large enough audience on the platform. The challenge for bayt.com now is to evolve and grow beyond West Asia. The region has a significant expatriate population in managerial jobs and most of these people move on after some time there. Access to a global professional network becomes important for them and so there is a threat from networks such as LinkedIn. Changing a successful business model is not easy but firms that fail to do so often pay a heavy price. "It had a clear business model and kept the focus on potential employers employees before bringing in advertisers"
Necessity continues to be the change agent even in the dotcom age. The founders of bayt.com had almost everything going against them at the start. The dotcom bust, a crowded market and well-funded competitors. They had to innovate or perish. Innovation need not necessarily be a new way of doing things. It could very well be, as bayt.com has shown, the application of traditional methods in a new context. Sticking to the basics but in an untried arena. The first, basic requirement for bayt.com was to get noticed in a crowded environment. Bayt.com's use of the TV as a pioneer in the dotcom world was truly brilliant. TV also brought credibility to bayt.com at the time of the dotcom bubble burst. There is an important lesson here. While the amount of money spent on TV by bayt.com was high, what the job portal has highlighted is the necessity of deploying critical resources where these can create the maximum impact and provide the necessary impetus for survival and thereafter, success. Many start-ups hesitate to partner. Often the fear of sharing knowledge and revenue holds them back. Bayt.com highlights the power of right partnering. It was a win-win arrangement for both sides - traffic for the dotcom sites and CVs for bayt.com. This helped bayt.com scale rapidly and gain the threshold size needed for recognition as a serious player. It doesn't matter whether you are a pioneer or a late entrant. Stick to the basics - you cannot go wrong. "Innovation need not necessarily be a new way of doing things. It could well be, as bayt.com has shown, the application of traditional methods in a new context"